Geo-engineering schemes aimed at tackling global warming through artificial iron fertilisation of the oceans would significantly affect deep-sea ecosystems, according to research involving scientists from the United Kingdom's National Oceanography Centre (NOC) as well as former Ocean and Earth Science research students of the University of Southampton, which is based at the Centre. Most scientists believe that the rapid increase in atmospheric carbon dioxide resulting largely from the burning of fossil fuels is causing the world to warm up. One proposed geo-engineering scheme aimed at mitigating global warming is ocean iron fertilisation, the ecological consequences of which are as yet inadequately understood. Biological production in the oceans is dominated by phytoplankton growth in the sunlit surface waters. Through the process of photosynthesis, these tiny marine plants draw large amounts of carbon dioxide down from the atmosphere. When they die, some of the carbon assimilated in their bodies is exported to the deep ocean. Boosting this 'biological carbon pump' could in principle reduce the amount of carbon dioxide in the atmosphere. Phytoplankton growth in many areas of the open ocean is limited by the low availability of iron, despite the presence of high concentrations of other nutrients. Relatively small-scale experiments have shown that fertilising such areas with iron increases phytoplankton growth. Therefore, adding large amounts of iron over long periods of time should increase the magnitude of the biological carbon pump. "To get a handle on how long-term, large-scale iron fertilisation might affect deep-sea ecosystems, we studied natural iron fertilisation off the Crozet Islands in the southern Indian Ocean," said research team member Dr David Billett of NOC. During a research cruise aboard the RRS Discovery, the researchers compared two deep-sea regions about 460 kilometres apart and with water depths of around 4,200 metres. One of these regions received iron naturally leached from the volcanic islands, leading to a large phytoplankton bloom in the spring, whereas the other did not. Otherwise, the two sites were similar, and there were no physical barriers that could stop organisms dispersing between them. The researchers collected animal samples from trawls and sediment cores, and used both still and video cameras to survey life on the seafloor. They also measured the amount of organic material sinking down to the seabed from the sunlit surface waters, and analysed its chemical composition. They found that the seabed at the site enjoying natural iron fertilisation received more organic material over a longer period and of a higher nutritional value from above than did the iron-limited site. The sinking organic matter at the former site was also richer in carotenoid pigments important for sea cucumber reproduction. These differences reflected the contrasting productivity of the surface waters at the two sites, as well as the phytoplankton species present. Due to better organic matter supply, the seafloor of the iron fertilised site supported a larger abundance of deep-sea animals such as sea cucumbers (holothurian echinoderms) and brittle stars (ophiuroid echinoderms related to starfish). In addition, whereas some sea cucumber and brittle star species were found at both sites, others prospered only at one or other site. This resulted in major differences in species composition and evenness, with the animal community of the seafloor at the iron-fertilised site resembling that of the productive North East Atlantic, more than 16,000 kilometres away. "Our findings show that the timing, quantity and quality of organic matter reaching the seafloor greatly influences biomass and species' composition of deep-sea communities off the Crozet Islands, as it does in other oceanic regions," said Billett. "Because the amount and composition of sinking organic matter is affected by iron supply to the surface waters, it is likely that large-scale, long-term artificial iron fertilization, as envisaged by some geo-engineering schemes, would significantly affect deep-sea ecosystems." However, whereas natural iron fertilisation increased ecosystem biomass, there was no evidence of damage due to reduced oxygen concentration at depth, which may assuage the concern that artificial ocean iron fertilisation might cause the seafloor to become a biodiversity desert due to lack of oxygen. 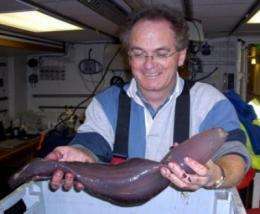 If he's holding a deep sea cucumber at sea level, shouldn't it explode? Given the track record of government-funded scientists working on climate change, I would prefer that they not implement any changes that might alter the ecosystem for everyone.